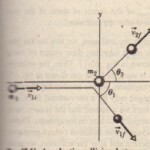 Shows the third law force pair,that acts during a simple head on collision between two particle-like bodies of different masses. These forces will change the linear momentum of both bodies the amount of the change will depend not only on the average values of the forces, but also on the time tot during which they act. To see this quantitatively, let us apply Newton’s second law . where At is the duration of the collision. The value of must be such that the area within the rectangle is equal to the area under the actual. CHECKPOINT 1: A paratrooper whose chute fails to open lands in snow; he is hurt slightly. Had he landed on bare ground, the stopping time. would have been 10 times shorter and ‘he collision lethal. Does the presence of the snow increase, decrease, or leave unchanged the values of (a) the paratrooper’s change in momentum, (b) the impulse stopping the paratrooper, and (c) the force stopping the paratrooper.